Hadjithomas and Joreige have to deal with the lack of documentation on the history of Beirut, as well as with the often truncated accounts of its history. 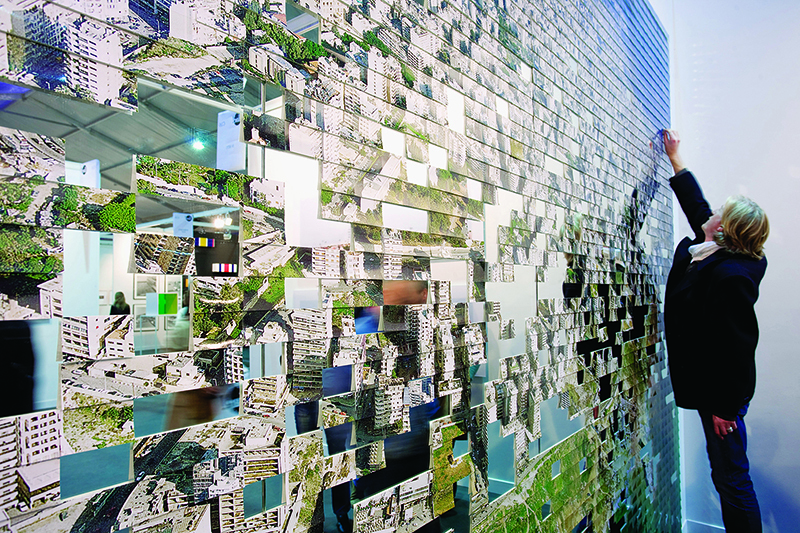 In Circle of Confusion (2001), they invite viewers to remove and scatter 3,000 fragments of an aerial photograph of the city. Reduced to a fragile and transitory surface, the image echoes the destruction, both historical and symbolic, of Beirut. Offsetting the stigmatization and erasures of the events of the Lebanese civil war, the artists have created an image slated to slowly disappear, one that evokes memory gaps. This work questions the representation of the city and critiques ready made definitions of it. Each of the 3000 fragments affixed on the mirror is numbered and stamped “Beirut does not exist”. The installation allows the viewer to choose to reveal himself through his own reflection: It is impossible to grasp the city, one can only take a fragment of it. The work is presented for the first time in Canada. Joana Hadjithomas and Khalil Joreige work in tandem at the crossroads of art and cinema, exploring the capacity of images to represent the history of Lebanon. Using historical archives, postcard images of urban warfare, aerial photographs taken from the Internet, and tech- nically unsophisticated films (Don’t Walk, 2000), the artists draw on media that bear the weight of collective memory and question their value as testimony. Hadjithomas and Joreige constantly subject images to destructive processes in which iconoclastic gestures appeal to viewers’ critical subjectivity (Circle of Confusion, 2001). In the ongoing project Wonder Beirut, the illusionist dimension of the photograph is also disrupted by the artists, who reduce it to a surface to be damaged, fragmented, and burned. By making media used to record the real more fragile, they reveal memory gaps associated with the trauma of the civil war in Lebanon (1975–90). Fighting against orientalism and the stigmatization of images of Beirut (Postcards of War, 1968–90), the artists produce intermediate images suspended somewhere between the archival and the fictional. Their works are not intended to document the real in its totality; rather, operating by means of allu- sion and suggestion, they evoke what cannot be represented and show why it is necessary to reinvent the imagination of a country and its collective identity. Joana Hadjithomas and Khalil Joreige have made both fictional films (A Perfect Day, 2005; Je veux voir, 2008) and documentaries (Le Film perdu, 2002; Khiam, 2003), and their installations have been presented in Beirut (Mois de la photo au Liban, 1998) and Europe (Beyrouth: fictions urbaines, Institut du monde arabe, Paris, 1997; Iconoclash, ZKM, Karlsruhe, 2002). In 2009, several exhibitions were devoted to their work (We Could Be Heroes, Just for One Day, MAMVP, Paris; Videoworks: Wish We Could Tell, A Space Gallery, Toronto). Tuesday to Friday, 12 p.m. to 6 p.m.; Saturday 12 p.m. to 5 p.m.
> Artists’ talk, Friday, Sept. 11, 2009 at 4 p.m.
> CIBL’s radio program Le 4 à 6 will be broadcast live from the gallery on Friday, Sept. 11, 2009 from 4 p.m. to 6 p.m.
Joana Hadjithomas and Khalil Joreige, Circle of Confusion, 2001. Installation view, Cour Carrée du Louvre, Paris, 2006. Photo: © Emmanuel Nguyen Ngoc. Courtesy of Emmanuel Nguyen Ngoc and the artists.